Before the season when you looked at this game you probably saw a potential gem. Two teams on the rise, expected to be fighting for their division titles, and playing each other as elite members of the AFC. It hasn’t quite turned out that way. The Houston Texans have more than done their part. They have been almost flawless, winning by an average of 17.5 points per game. They have consistently looked like the best team in football. New York, though, is another story. The Jets are a soap opera with issues all over the field. Their loss at home to the Niners on Sunday was easily the worst performance by any team all year. It’s lazy to say that they are a bad team, but they certainly aren’t playing like a good one right now. For the Jets, the stakes are particularly high. Right now they are still improbably tied for the lead in the AFC East with the Patriots and the Bills. It’s a golden opportunity despite their poor play, but they can’t afford to lose again because once they fall behind the Patriots it could be for good. There is no such thing as a must-win in Week 5, but the Jets are almost there. You can’t talk about the Jets without first talking about their QB situation. It frankly hasn’t been very good. In fact, outside of their first game the QB play has been lousy. 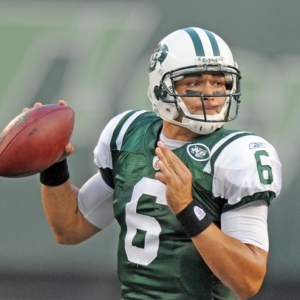 Mark Sanchez was as good as he has ever been in the opener. In the last three, though, his best completion percentage is just 46.7 percent, and twice over that stretch he has amassed less than 140 yards. It’s just not good enough for the NFL. The much-ballyhooed arrival of Tim Tebow hasn’t made much impact, either. In fact, Tebow has essentially been invisible. He has thrown one pass, and he has rushed just nine times. His biggest impact has actually been on special teams, and that’s not exactly what he was brought in for. The QB play needs to be dramatically better if the Jets want to be a legitimate team, and it’s hard to be optimistic. Beyond that, though, what makes this situation so interesting is that it is so polarizing. Fans are always interested in QB controversies, but rarely has one been so nationally relevant. People either love Tebow or hate him, and either way it can impair your ability to judge the situation, and therefore this team, accurately. Bettors need to be aware of this and not let it drag them down. Injuries can hold a good team back, and no team has been hit harder in its guts so far than the Jets. In the first four weeks of the season they have lost their best defensive player in Darrelle Revis, and now their biggest offensive weapon in Santonio Holmes. Either would be a big blow to any team, but when you remove both guys from a team that is already underperforming, and which has clear attitude issues, it could be too much to overcome. It’s not automatically a damning situation, but they will have to be tougher and more resilient than they have been so far to thrive in this circumstance. The key matchup to watch here is going to be the Houston running game against the Jets’ defense. The Texans aren’t necessarily an elite running team, but they are in the Top 10, and Arian Foster is in form and has exceeded 100 yards twice in four games. The Jets have been terrible against the run — their 173 yards per game is second worst in the league, and they were absolutely torched by the Niners last week. If the Texans are able to establish their running game early then that will open up room for their passing game to really shine and the Jets will be in trouble. If the Jets can plug the holes in the defensive line effectively, though, then they could be competitive. Not surprisingly, the public is all over the Texans in this one. They have drawn about 85 percent of bets so far. The line opened with the Texans favored by a touchdown, and that has widely climbed to nine points. The total opened at 405, and has since climbed a point to 41.5. For some strange reason the fifth week of the season has not gone well for the Texans over the years. In the last seven seasons they are a sadly perfect 0-7 ATS in this week. They have also struggled against the Jets, going 1-4 ATS in the last five. If you buy into historical trends then you’ll also like this nugget — the Jets have gone “over” each of the last five years in their Week 5 contests. I don’t think it will come as a surprise that I’m not high on the Jets. In games like this you can be worried about such a big line — especially on the road — but I just don’t think that it’s necessary here. the Texans have proven themselves dominant to date, and the Jets are troubled and ineffective. Ultimately, the spread would have to be bigger than this to scare me off. I’ll take the Texans happily. On the total I lean to the “under,” but not with near the confidence I feel for the side.